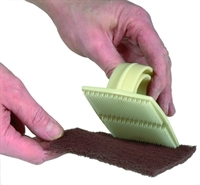 Hand Sanding Block: Uses standard grip discs, either 125mm or 150mm, making your usual sanding discs dual purpose. Tex Holder: Tex holder with strong hooks ensuring a good grip on tex sheets. Suitable for use for oxide removal, graining stainless steel, matting primary coats and surface preparation. Size 140 x 80 mm. These holders help to get the best out of non-woven Tex hand pads and non-woven abrasive rolls, especially when hand-sanding flat surfaces. These blocks accept grip discs, making 1 pack of discs dual purpose for both machine and hand sanding.